The new 2000 AD Art Stars theme has been announced! 2000 AD Art Stars is your chance to get into the pages of 2000 AD AND get paid for it! Some of the biggest artists in comic books got their break at the legendary award-winning 2000 AD – and you could be joining them! Our art competition - 2000 AD Art Stars - is your chance to get into the pages of 2000 AD AND get paid for it! Every quarter we announce a new theme and would-be art droids can submit their entries. Our editor will then choose their favourite image for publication. Plus, two runners-up will be chosen and receive zarjaz 2000 AD graphic novels! This is your chance to follow in the footsteps of some of comics’ greatest artistic talents and, who knows, maybe break into the industry yourself! 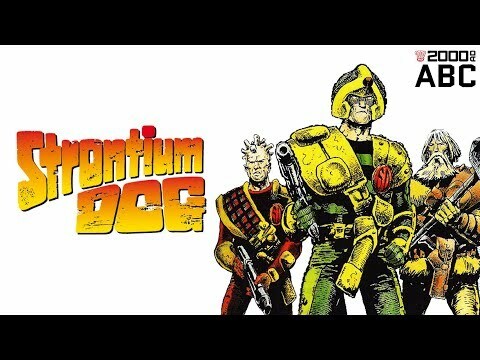 The theme for the next 2000 AD Art Stars competition for spring 2019 is STRONTIUM DOG! The deadline for entries is 9pm GMT on Friday 31st May. Before submitting, please carefully read the terms and conditions at the official competition page. Meet 2000 AD Art Stars winner Ev Shipard! The 2000 AD Art Stars competition not only brings back the much-loved Star Scans to the pages of the Galaxy’s greatest comic but also gives some amazing artists their chance to break into comics! The second 2000 AD Art Stars competition winner, with a spectacular image of Rogue Trooper in all-out action, was artist Ev Shipard. You can see Ev’s Art Stars Rogue, in all its glory, printed in the pages of 2000 AD Prog 2120, and can find more of his work at instagram.com/evshipardart and evshipardentertainmentart.com. If seeing the Art Stars winner this time has made you want to put ink on paper, the next topic, running until June, is the greatest of all bounty hunting sci-fi sagas, Strontium Dog. Want to see your art in a Prog & get paid? Find out more over at 2000AD.com/artcomp. Congratulations on your Art Stars win, first of all. What does getting your art into the pages of 2000 AD mean to you? Ev Shipard: Thank you, I’m very excited about having my Rogue in print in 2000 AD. It’s a first for me and a real buzz to be part of an intellectual property that inspired me from an early age. As for the Art Stars piece, in particular, what were your thoughts when coming to start the work? What were you trying to capture with the art and how did you, eventually, accomplish something you were happy with? ES: I think key to making the Rogue Trooper painting work was to capture a moment from the firefight and immerse the viewer- Imagine a frame from a film with the apocalyptic, poisoned landscape of Nu-Earth, with the Nort troops coming through the deadly fumes and the smoke. I’d usually go for a wider cinematic framing but to accomodate print I wanted to make sure it worked in the vertical format. Obviously, the figure of Rogue is the main focal point of the piece and his blue skin made a perfect contrast in my piece to the heat of the scene around him. But, around Rogue, I used many different compositional elements, the fiery embers, smoke tendrils, missile trails, to guide the viewers’ eye around the frame to, hopefully, create something of a narrative for viewers, giving them something of the wider story of the moment I’d presented. In your Art Stars piece, you’ve kept all of the traditional elements of Rogue Trooper, but managed to pack the piece with such action and intensity. Your painted art would indicate, at least to me, some love of the great artists working in this style, the George Pratts and their like? ES: I love a narrative piece and I love the idea of the human condition, or in this case the genetically modified human condition. It’s hard to put yourself in this character’s shoes but I wanted to immerse the viewer in this moment on the battlefield- almost a tactile, sensual quality- they can smell the fumes, the smoke and feel the burning embers. My ‘go to’ for references is generally classical fine art even when I am working on film projects. And I do love a digital piece that blurs the lines between traditional oils and Photoshop, I often bring elements or texture from my fine art pieces into my commercial work and have painted a number of pieces purely in oils or acrylic for other sci-fi properties. I am a big fan of George’s work and his impartial approach to traditional media. When it comes to the representation of war and the human condition you can’t go past Pratt’s art. Similarly, there’s an Australian war artist, Ivor Hele, whose draftsmanship and dynamism in his figure work is just incredible. Now that you’ve had that first experience of being in the pages of a Prog, is it something you’re going to be pursuing further? When did you first see Rogue Trooper in the pages of 2000 AD and what was the impact of the strip upon you? ES: The first thing I remember about Rogue Trooper is that incredible Dave Gibbons’ artwork. I can’t remember the particular Prog, but that art left a great impression, as did Cam Kennedy’s work when I discovered that sometime later on. With comic books I would generally follow the artist rather than the book. The whole sci-fi, post-apocalyptic imagery and ideas was what got me. And expanding that a little wider, when did you first pick up 2000 AD? I suppose growing up in Australia it was slightly more difficult to get hold of? ES: I’m now going back through old issues rediscovering a lot of the stories. I have a bunch of old 80’s original issues but being here in Australia it was a challenge to follow as we didn’t always have access to the books. It’s great to see the Complete Case Files of Judge Dredd more recently collected which is a good way to spend a Sunday afternoon with a nice strong coffee. When did you first start making art and are you professionally trained, or self-taught? ES: It’s hard to remember but I have always drawn, I found it the easiest way to express myself from a very young age. Commercially I started selling work around age 16 depicting how Christmas displays would look for shopping centres. During school, art was my focus and primary outlet inspired by contemporary artists of the time and the classic masters. I’ve always worked in creative industries however I was mainly self taught until I enrolled and was granted a scholarship at the Julian Ashton Art School in Sydney around 2009. Can you give us an idea of your background, what you do professionally, where you see your art at the moment? ES: I’m a traditional artist and digital artist working in the film and entertainment industries. I’ve had the pleasure of working with some of the top directors in the world and creating art on projects such Alien: Covenant, 300, Mad Max: Fury Road, Gods of Egypt and The Chronicles of Narnia. I also paint in traditional media with a focus on narrative and figurative work. Classifying a particular stage of my art is always difficult- as a creative it is a life long endeavour; ‘Always the student and never the master.’ That said, after 20 years in the entertainment industries I regularly teach workshops in Australia yet also attend workshops internationally when I can to expand on my own education. Your work constantly grows and shifts as you start to narrow down your self-expression, however my commercial digital approach hasn’t changed that much and I often like to focus on the narrative, mood and atmosphere with my pieces. ES: In addition to those comic artists mentioned already, Dave Gibbons, Cam Kennedy, George Pratt, there’s John Buscema, Mike Mignola and Philippe Druillet. But there are many artists that inspire me from the classics, Rembrandt to Delacroix, to more contemporary artists, such as Zdzisław Beksiński and Phil Hale’s dark, dynamic work. Also the Australian Impressionists and their sense of light and atmosphere have had a massive impact on my work and with most of their art hanging in the Capital cities here in Australia I make regular trips to view it up close. Finally, what about plans for the future, both 2000 AD and beyond? ES: I’ve been lucky with opportunities in the film industry, am very grateful and will continue with these projects but I would like to push further into the graphic novel realm with 3 projects that I have on the back burner. I am also very partial to opportunities for cover work on a number of properties that I think my style could suit! 2000 AD Art Stars winner announced! Which was the winning entry in the 2000 AD competition to find the art droids of the future? The winner of the latest 2000 AD Art Stars competition has been announced! 2000 AD Art Stars is your chance to get into the pages of 2000 AD AND get paid for it! Star Scans have been a staple of 2000 AD since its earliest days: single-image pin-ups of the greatest characters in the galaxy, from Judge Dredd and Strontium Dog to Dan Dare and Rogue Trooper, drawn by some of the best artists in comics from Brian Bolland and Dave Gibbons to Jock and Liam Sharp! Every four months, we give artistic Earthlets the chance to submit Star Scan pin-ups based on 2000 AD characters – and the winner, chosen by the editorial team at 2000 AD, will be published in a future edition of the Galaxy’s Greatest Comic. PLUS they’ll be paid for their art! The 2000 AD blog talks to the winner of the first 2000 AD Art Stars competition, who'll be getting their work published in 2000 AD! Mark Montague is the first winner of the 2000 AD Art Stars contest, the incredible competition giving you the chance to see your art gracing the pages of a future issue of 2000 AD! Mark's piece shows Judge Dredd captured and in the clutches of Brother Morgar and the Brotherhood of Darkness, fondly remembered by us all from the 'Cursed Earth' saga and will be appearing in a future Prog as a Star Scan. The Star Scan has been a staple of 2000 AD for many years, with pin-ups over the years from many of the greatest names in 2000 AD and British comics history, including Brian Bolland, Dave Gibbons, Kev O'Neill, Jock, Liam Sharp, and many more. The second Art Stars theme for winter 2018 is Rogue Trooper, so get your entries in as soon as you can! We'll be featuring selected entries on 2000 AD's social media and the very best will be featuring in the Prog! After finding out about the Art Stars competition, with the inaugural theme of Judge Dredd, how long did it take you to decide on that final image, of Dredd in a passive pose, captured by Brother Morgar and the Brotherhood of Darkness from the Cursed Earth saga? MARK MONTAGUE: I did several ideas but I decided against a cool pose of Dredd holding a gun or posing on his Lawmaster, because most of the great 2000 AD artists had already done iconic covers like that, so I wanted to try and paint a scene which was telling a story. Like many readers I was a fan of Brian Bolland’s Eagle covers, which had Dredd in very stressful predicaments but he wasn’t fazed by the situation. The covers of Judge Dredd No.5 and No.32 are perfect examples of this. In the back of the Titan Books 'Cursed Earth' collection, Bolland had drawn some posters, which depicted scenes from the story in greater detail or sometimes a scene that didn’t actually take place at all. I liked Morgar and the Brotherhood of Darkness but always felt that their story was a bit rushed and I always wanted to see more of them, so my picture is a scene that takes place after Bolland’s image for the No.5 US reprint. I still wanted to get a bit of humour into the picture by having Morgar adding a bit of seasoning, to make Dredd a bit more appetising to digest. Also, I had Dredd, looking more miffed than terrified. Is this your first appearance in the pages of 2000 AD and what does it mean knowing you’ll be seeing your art as a Star Scan? MM: To have my work published in 2000 AD is a dream come true, though this isn’t the first time for me being published in 2000 AD. From the early to mid 80s I had some of my drawings published in Tharg’s Nerve Centre. I had a 'Rogue Trooper', 'Strontium Hog', 'Judge Schwarzenegger' and a 'Joe Pineapples' picture published. Going back to your earlier days now, when did you first get into comics and how long was it before you picked up your first Prog? MM: It was around 1978, although it tended to be a bit off and on, mainly due to the fact the newsagent never ordered many copies. So, one week you would get an issue of Starlord but the next week, somebody else had brought the next instalment of Starlord, so you would buy Spectacular Spiderman instead, or whatever was left. My first 2000 AD was Prog 180 with the classic, 'Judge Child' story. Even though I had missed most of the previous parts of the story by then, I was hooked from that point on. Looking back over the history of 2000 AD, what strips or characters are your favourites? And what artists have had the most influence on your ownwork? MM: Dredd, Rogue Trooper, Button Man, Sláine, Nemesis, Nikolai Dante and The Order. As for artists, Ian Kennedy & Cam Kennedy’s approach to shadows, bounce lighting, aircraft, vehicles and weaponry is something that influences my work. As well the work of Brian Bolland, Mike McMahon, Glenn Fabry, Simon Bisley, Greg Staples, John M Burns and Colin Wilson. Can you give us some idea of your artistic background? Did you always want to get into comics art or has the process been a more roundabout one? MM: I’m 48yrs old and I’ve had no formal art training. I did an art foundation course and was disappointed to discover that the tutors weren’t going to teach us anything useful about drawing or painting. It meant that I had to teach myself to get better at art, which is okay but without a mentor, it means that you take a lot longer before you are ready to start working as a professional artist. I managed to get some work as an animator, then I become a 3D modeller and all these disciplines feed into my 2D work. From 3D modelling I discovered ambient occlusion, sub-surface scattering, bounce lights, fill lights, rim lights and from animation I got the importance of good acting and strong poses that help convey an emotion to an audience. What comics work have you done already before this Art Stars win? MM: I did some self-published work which was sold in my local comic shop in the early '90s. My artistic range ran from humour strips (The Cosmic Sausage) to my arty style, trying to channel my inner Bill Sienkiewicz, for a strip about a person who was unaware that they are a prisoner. I then stopped drawing comics for a while, when I became an animator. MM: To get a chance to paint some covers for 2000 AD and the Megazine, which hopefully people will like! For more details about the 2000 AD Art Stars competition and how to enter, visit the 2000 AD website.